Use the alumni card to identify yourself as an active UHAA member! Participating entities that provide discounts include Campus Recreation, University Libraries, the UH Bookstore plus discounts and special promotions from our partners. Check out the full list of benefits here. 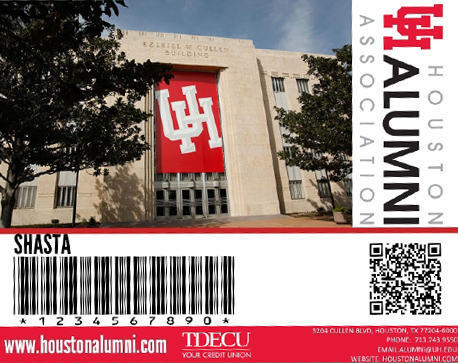 Effective September 1, 2016, the UH Alumni Association will begin providing plastic and digital alumni ID cards to all alumni of the University. These cards identify alumni and provide benefits at many different places, such as Campus Recreation, University Libraries and the UH Bookstore. Discounts and special promotional items from many of the sponsors/partners of UHAA are also available. All alumni with an email on file with UHAA will receive a digital alumni ID card. If you have any questions, call us at 713.743.9550. Follow the link here and after you’ve logged in with your username and password your card will be visible and available for download. In a few short minutes, you’ll have an all new card. The numbers located on your card represent your alumni ID number. So now that you have your personal QR code on your digital alumni card, lets explain how to use it! It’s actually pretty easy…but you have to have the right tools. To use QR codes conveniently you must have a smartphone equipped with a camera and a QR code reader/scanner. Luckily the newer smartphone models often have these features pre-installed or you can easily download a QR code reading app from your app store. We’ve listed a few free options that work well on each platform. You can scan your unique QR code from your computer monitor, printout and in some cases you can scan directly off of your phone screen (see links below). Once the code has been scanned you’ll be able to participate in various promotions, contests and future alumni activities. To access on-campus benefits at the Campus Recreation Center, University Libraries and the UH bookstore. Y ou will be asked to show your card in order to receive special pricing and discounts. To keep track of offered benefits from our affinity and corporate partners CLICK HERE. We suggest you check back periodically as special offers will change. To have priority entry into UHAA events, such as Party on the Plaza which takes place prior to every home football game. There will be a separate entrance for graduates who have their alumni cards with them. All UH graduates with a good email address on file will receive a digital Alumni Card via email by September1. Instructions on how to access and save your card will be included. All life-Members and University wide donors who have contributed a significant amount financially will also receive a plastic card. For Life Members this will be replace any prior alumni card they may have received. Please contact the Alumni Relations Office at alumni@uh.edu or 713.743.9550. We would be happy to help you! the digital card allows Life Members the same access and capabilities as the physical card. You can present either form of the card as proof of membership. Click on the image within the email that says “download here”. Once you’ve done that, click on the image displaying your name. Then, right click and save the image if you are viewing it on a computer. If you are viewing on a smartphone, hold the image down and a screen will prompt you to save the image to the smartphone. You also have the option to print the image or screenshot it to your camera roll. Please check back for more details. We are working to determine the best way to partner.